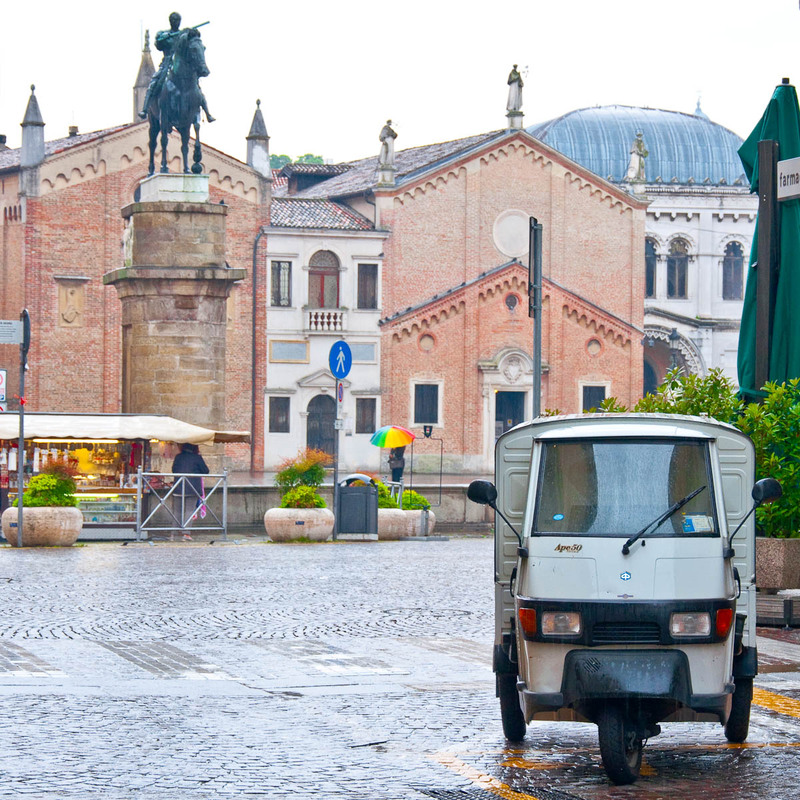 I am in Padua, in a nondescript patisserie and outside a torrential rain is soaking the city streets. It is ten o’clock in the morning and the day already gives off a wet, dark and miserable vibe. Don’t feel sorry for me though! As I have just taken a bite off what I can only describe as heaven on Earth. It is soft, it melts on the tongue, it awakes taste buds I didn’t know I had. Suddenly, the day doesn’t look so bad after all. I look around myself with revived interest. On the other side of the street I notice an iconic Ape50 (one of the cutest Italian cars). To the left is Donatello’s statue of a horseman dating back to 1453. The centuries-old chapel Scuola del Santo which is covered in frescoes by Titian and several other artists serves as a backdrop to this Italian scene. The thick rain doesn’t matter anymore. I sip my coffee reveling in my glorious surroundings. For a moment, I feel perfectly happy, floating on a little white cloud above the greyness of the day. Ready for another bite, my attention turns to the chocolate bar in my plate. 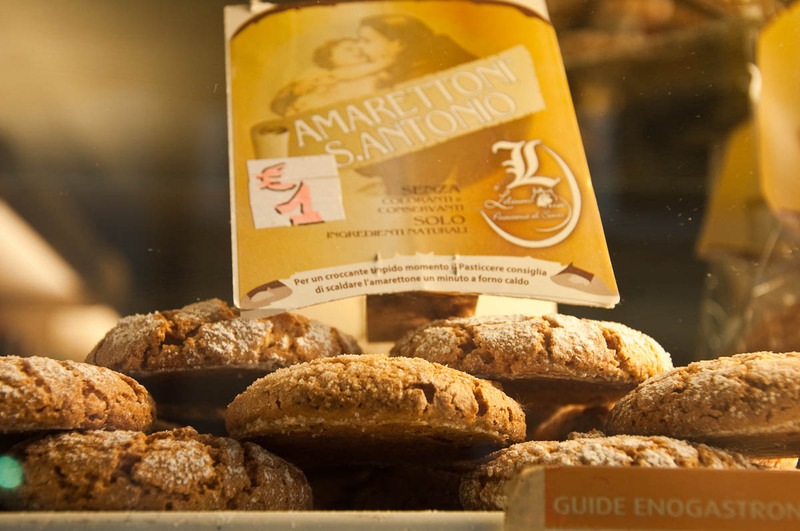 I remember its name: ‘Santantonino‘, neatly written on a green card in the cafe’s sweets display. It is named after Saint Anthony – or Sant’ Antonio – the Catholic priest and friar who was born in Lisbon, Portugal and died in Padua, Italy almost eight centuries ago. He was canonized less than a year after his death and is one of the most venerated Catholic saints. 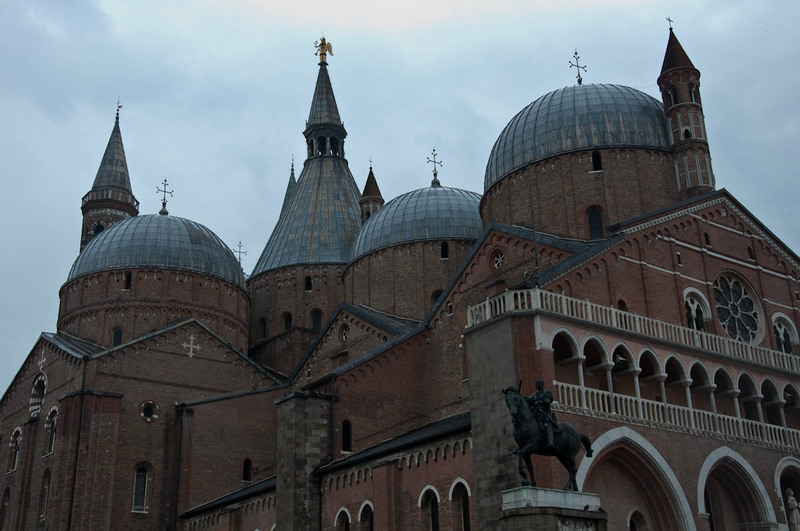 In fact, Donatello’s statue, the one I have been admiring from my seat, is right by the splendid Basilica of St. Anthony which is also almost eight centuries old. It houses the tomb of the saint and it is a place of pilgrimage for people from all over the world. I have visited it several times prior to this rainy day, but on this particular occasion I had returned there with a slightly different pilgrimage in mind. 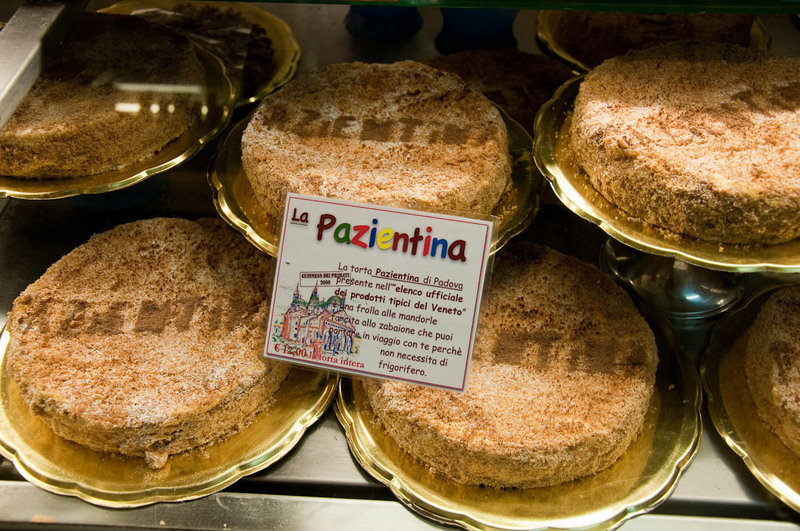 You see, the cafes and patisseries surrounding the basilica sell a very special cake. 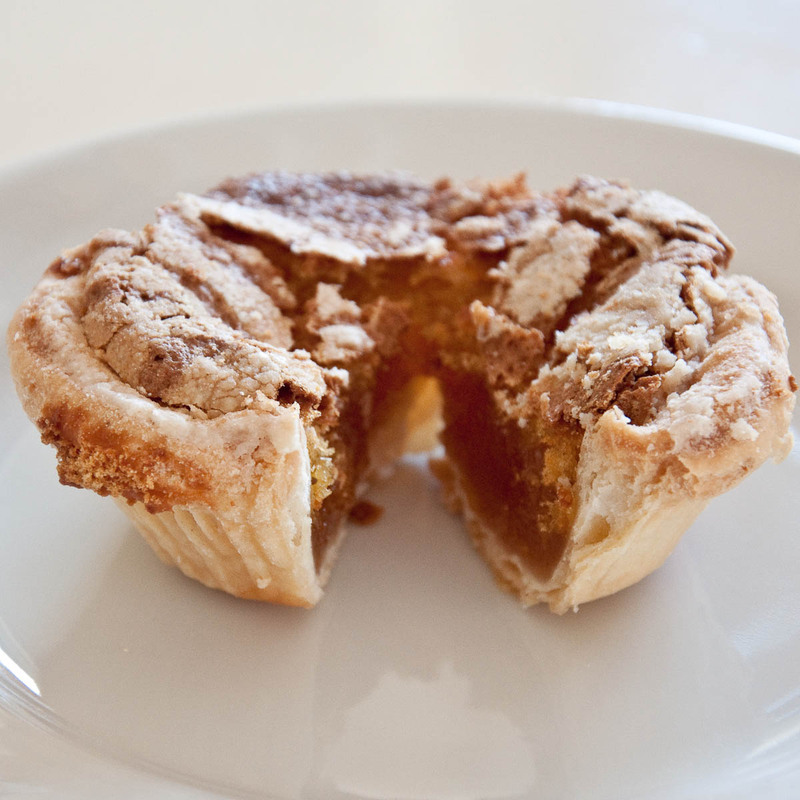 Called ‘Il Dolce del Santo‘ (in English ‘The Cake of the Saint’) it is a glorious concoction of filo pastry, marzipan, sponge, candied orange peel and a very generous helping of apricot jam. On its label it has a picture of St. Anthony holding the baby Jesus in his hands. I had tried it before and I had loved its taste, so I wanted to find out more about it and how it came to be associated with the saint. 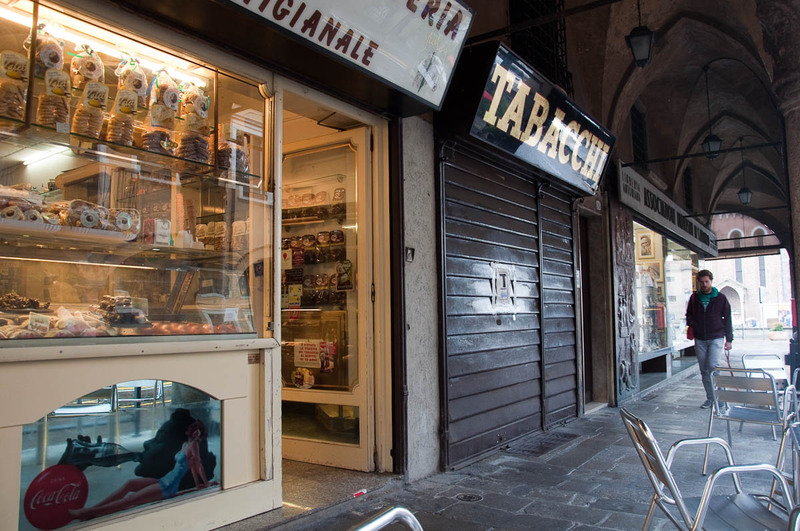 And even though it was raining so much, from my previous visits to Padua I knew the place to go to – Pasticceria Lilium al Santo in the arcade just up from the Basilica. The patisserie is tiny and every available space, nook and corner is taken by sweets. In fact, if you don’t want to drink your coffee standing up at the bar like the Italians do, the only three tables are outside in the shelter of the dark arcade. 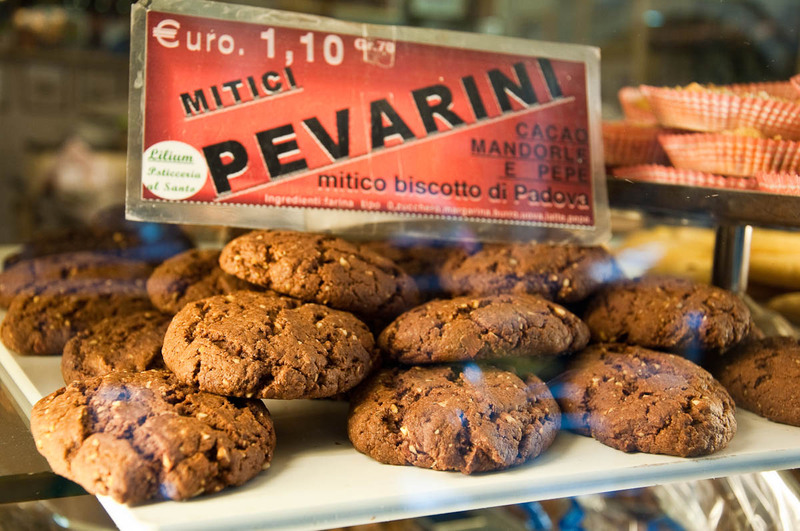 to the peppery Pevarini biscuits which are produced from almonds and cacao and are spiced up with black pepper. 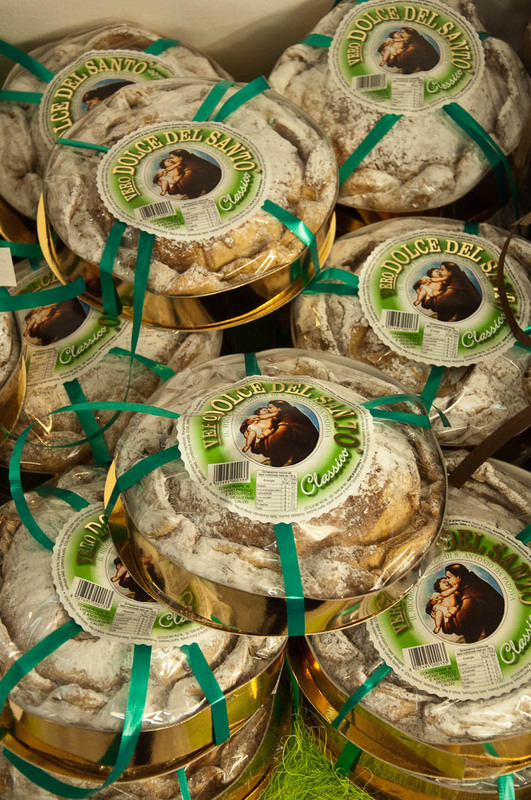 Among them all Il Dolce del Santo takes a pride of place. 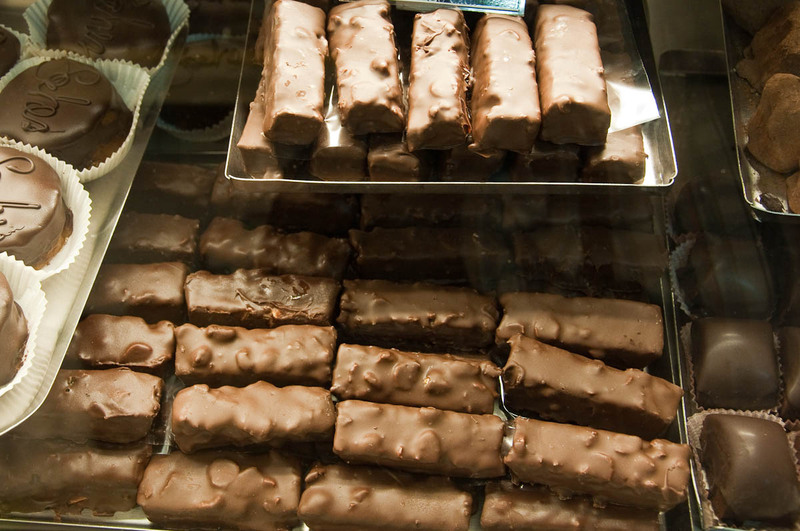 It comes in many different sizes – from large individual cakes to tiny bite-size ones sold packed in a bag of twenty or so. I even notice a new for me chocolate variety where the original apricot jam has been exchanged with a thick cacao paste. 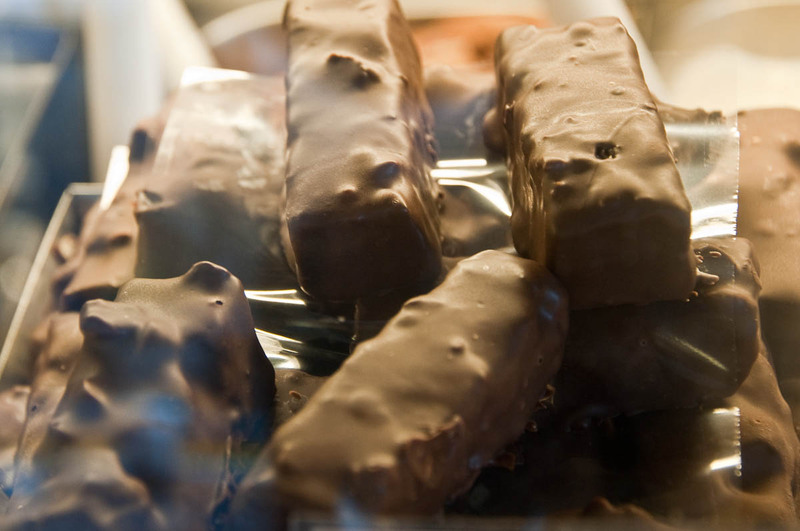 and said Santantonino chocolate bar which helped me enjoy the day in spite of the rain. Then he tells me about ‘St. 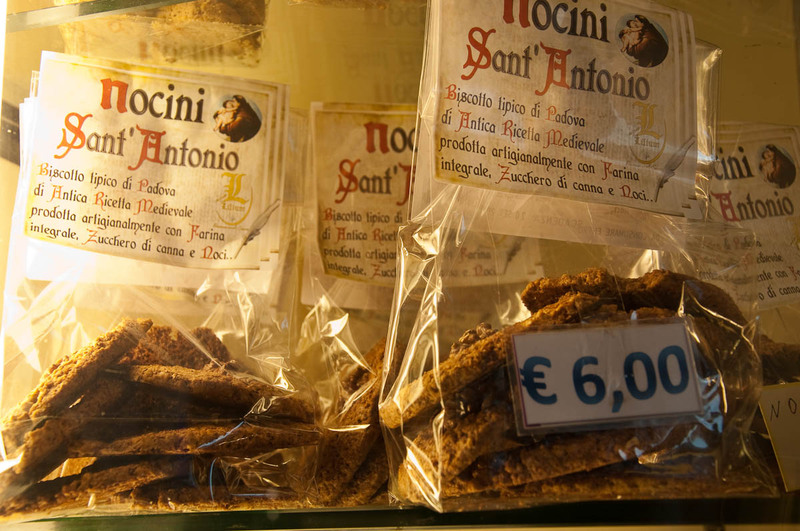 Anothony’s bread’ – a tradition to make a gift to the needy in the form of bread or other food as a thanks for blessings received through prayers addressed to St. Anthony. ‘It is the Catholic thing to do’, he affirms amiably, ‘to give bread to the poor, to the ones in need’. And then he continues telling me that about 60 years ago the patisseries around St. Anthony’s Basilica developed a recipe for what is now known as Il Dolce del Santo. ‘It was done step by step based on medieval recipes’, he clarifies and goes on to explain that the goal was to offer the pilgrims and the tourists a nice souvenir from their visit to the holy place. 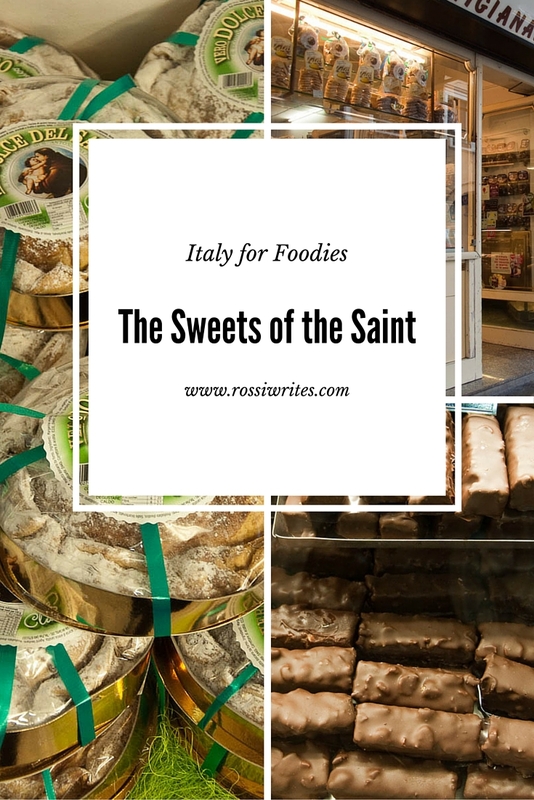 I buy a small individual Cake of the Saint and a bag of bite-size ones to take home. Once back at the train station, I pop into the local Tourist Information Centre and ask the ladies there if they can give me more details about Il Dolce del Santo. ‘It is only sold by the patisseries around the Basilica’, they tell me. 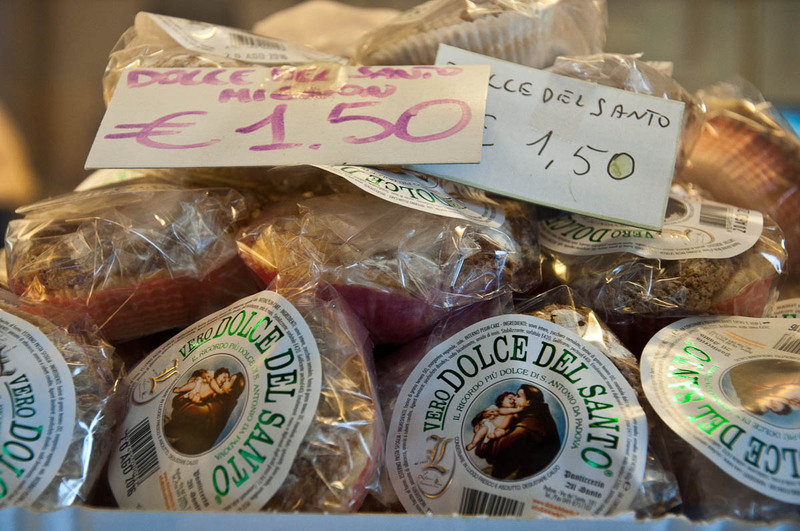 ‘About 25 years ago, they took a typical for Padua cake and gave it the name Il Dolce del Santo as a way to create a meaningful souvenir’, they add. ‘Wait, 25 years ago?’, I exclaim. ‘But the chap at one of these patisseries told me that this was done 60 years ago’. ‘No, no, it was about 25 years ago’, insists one of the ladies. So I thank her and go off to catch my train back to Vicenza. At home, I cut my cake and slowly eat it. A miracle or a marketing plot?! 60 years or 25 years ago?! Who knows! Il Dolce del Santo tastes good and that’s all that matters to me right at that moment in time. 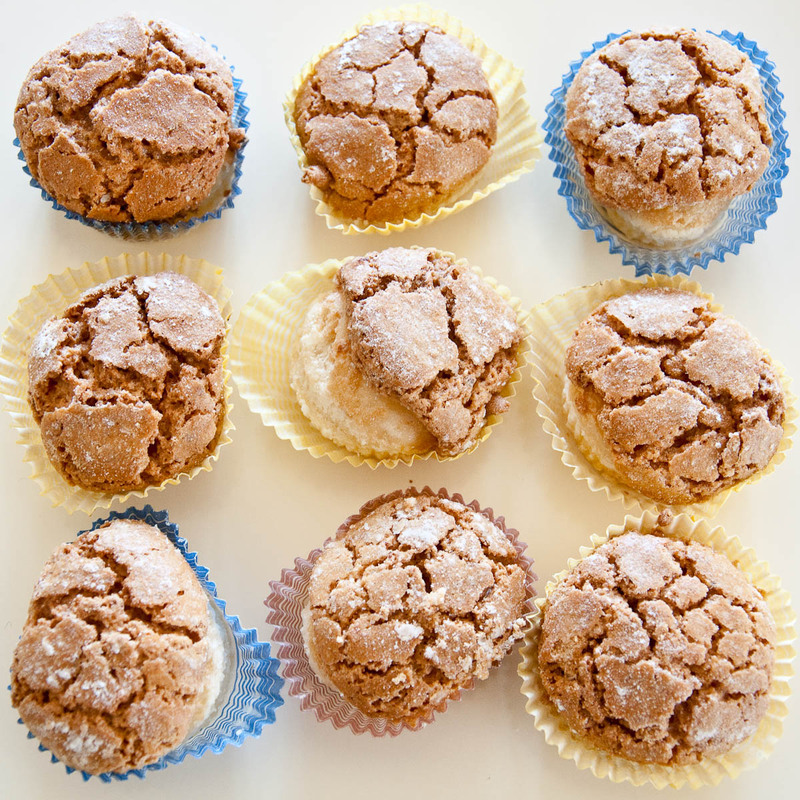 Have you tasted Il Dolce del Santo? Did you like it? Do you know more about its history and the tradition of making it? I would love to learn more about it, so, please, let me know!